Iranian Students Jailed For "Desecrating Islam"
An Iranian court has handed down prison sentences ranging from 22 to 30 months to students from Amir Kabir University students, who have been detained for about a year, for desecrating the sanctity of Islam. 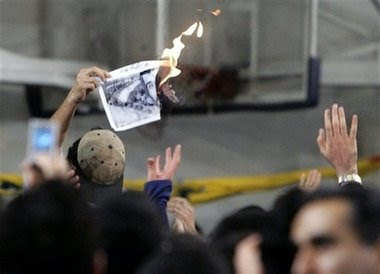 The students said that the real reason for their sentence is their participation in the students’ demonstration during a visit of Iranian President Mahmoud Ahmadinejad to the university, and their burning of his picture. The families of the students stated that their confessions were extracted from them under pressure and torture. Source: Rooz, Iran, April 16, 2008; Amir Kabir University students’ paper, Iran, April 14 and 15, 2008.